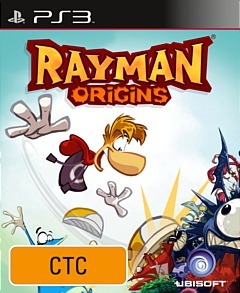 Rayman Origins PS3 Review. With a very sturdy gaming engine that works perfectly on the PS3 controller, Rayman Origins is not just a single-player experience but also a fun, frustrating and sometimes unforgiving experience that most gamers will enjoy. Available on the PS3, Wii and XBox 360, RAYMAN ORIGINS is the latest arcade platformer from Ubisoft that although returns gamers to the loveable franchise of Rayman, it does something even better by returning to classic 2D arcade gaming. 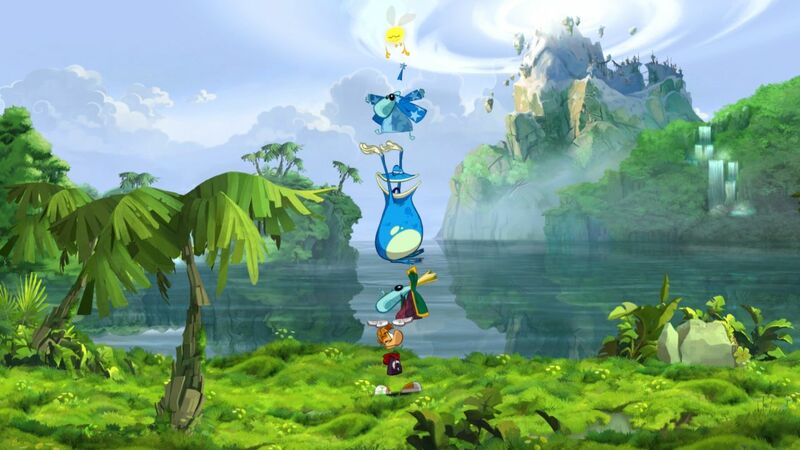 Reminiscent of titles such as Super Mario, Rayman Origins allows up to four players to work as a team as they attempt to progress through the colourful levels of this game. 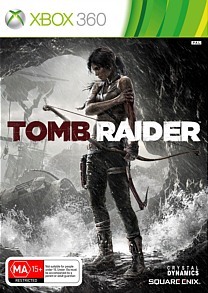 Although the game contains a rather generic story, the gameplay more than makes up for any lack of storytelling flaws. To help Rayman along his adventure, he is joined by Globox and the two Teenies as they engage in around 60 amazing and diverse levels across 12 environments with some beautiful hand drawn backgrounds. This is the game that the gaming world needed! 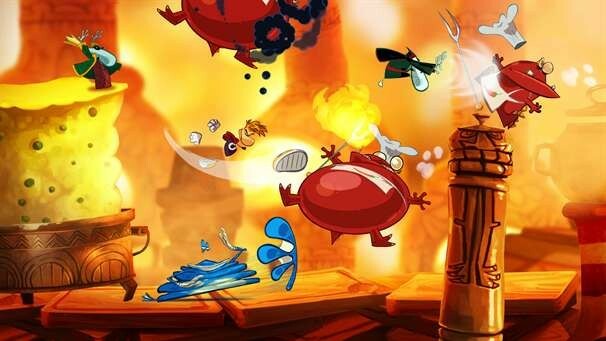 At its 2D core, Rayman Origins features traditional arcade mechanics which generally require the player or players to move from left to right with some up and down action. 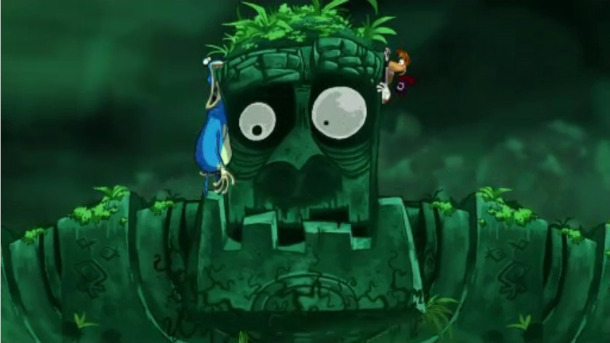 The game also contains a variety of Rayman inspired characters and opposed to just running, jumping, punching and performing your signature manoeuvre such as the Hairly Copter, the characters must sometimes work in conjunction to solve a particular puzzle or difficult area to navigate. It's also great that additional players can jump into the game any time. Even though the gaming mechanics are simplicity at its best, where the game does shine is through its wonderful level design that looks like something out of a Saturday Morning Cartoon with a touch of Quentin Tarantino madness from its whacky designs to deft defying physics. Although we reviewed this game on the PS3, the XBox 360 version looks just as good on FULL HD. Also, all the environments, colours and characters just seem to jump out at you. With that said, it's quite refreshing to go back to a tried and true formula and even though the game is 2D, it has this modern feel to it, thanks to the diverse and hand drawn world. Enemies play a key part to the gameplay and most of the time, you'll spend jumping on their heads or punching them as you stave off their attacks. Then you have the boss battles that have this Super Mario or Sonic the Hedgehog feel to them, thanks to these epic fights. The environment can also be used to battle your enemies that does make for some great strategy like tricking an enemy into a laser. There are also some fun items that your characters get access to throughout the game with some needed to solve a particular puzzle such as a gun to shoot lights or what not. You do have a set number of lives in single-player but if you want a guaranteed way of finishing the game easily, multiplayer may be the way to go. As a single-player game, Rayman Origins plays remarkably well, however as a multi-player game with up to four players, the game takes on this great retro feel as its every Rayman character for themselves. You do need to work as a team, however there is an element of greed employed, especially when you steal other items from your mates. I must make a special mention that when you do play with other players, you'll be dying quite a bit, especially when your caught on the edge of the left of the screen and the other players are moving right to progress. This can result in deaths but generally deaths occur from a poorly timed jump or from an enemy. When you do die, you will respawn in a bubble and in order to come back, one of your "living" team mates must pop the balloon. For those more seasoned gamers, sometimes its good to get your friends to die in order for them to make that mad dash through enemies or difficult jumps. With gameplay to die for, the graphics only enhance this fun experience. Luscious eye candy! That's what the graphics look like in Rayman Origins as everything appears bright, colourful and just like a cartoon. Even though the graphics look quite simplistic, it does have this unique art style to it that pays homage to the original Rayman game. Characters are well animated, special effects bounce around the gaming environment and everything comes together perfectly, even the annoying soundtrack and larger than life sound effects. Ubisoft should be commended on going back to basics but with that said, the game is not basic and expands the 2D arcade platforming genre. With a very sturdy gaming engine that works perfectly on the PS3 controller, Rayman Origins is not just a single-player experience but also a fun, frustrating and sometimes unforgiving experience that most gamers will enjoy. 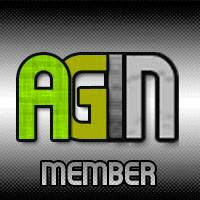 It's not just a game for kids but rather it's a game for all gamers. Definitely check it out if you want a respite from your stock standard gaming diet like Batman or Need for Speed.